If you have a question relating to relationships, partnership or love, you can use the love oracle spread. With this, you will get a good answer to your question(s). The most important topic of your partnership is shown in card 1. As first card you drew "Ace of Swords". The main meaning of this tarot card is: Possibility of knowledge or clarification. An opportunity to gain clarity and to guide a decision is brought about. Triumph of violence. The Ace of Swords is a card of great power.. It generally means: Possibilities and opportunities for objectivity, fair approach and clear findings. 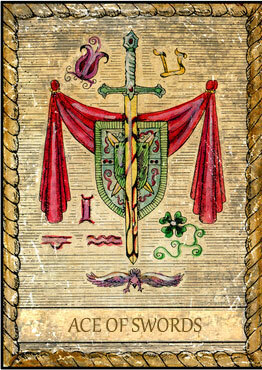 The card "Ace of Swords" also stands for: Triumph in love as in hate, conquest, great wealth or great misery. Reversed it points to: The same as above, but the results are catastrophic. Birth, propagation, diversity, marriage. You may not be aware of your inner attitude. Perhaps through the second tarot card "7 of Swords" is get´s clear to you. The main meaning of this tarot card is: Clever preparation. Shirk something underhanded. A plan that can fail.. It generally means: Fraud, lies and dishonesty. 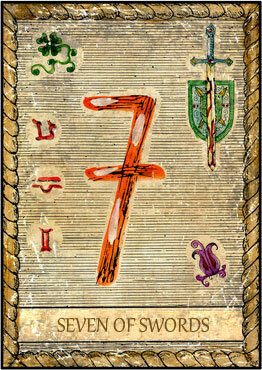 The card "7 of Swords" also stands for: Intrigue, trial, desire, hope, confidence, fights and trouble. Reversed it points to: Good advice, training, slander, babbling. The third card reflects the attitude of the partner to you. You drew "7 of Wands" as third card. The main meaning of this tarot card is: Fighting for a better position. One’s own position prevails. Confronting a conflict. Card of bravery and success.. It generally means: Defense, enforcement and determination. 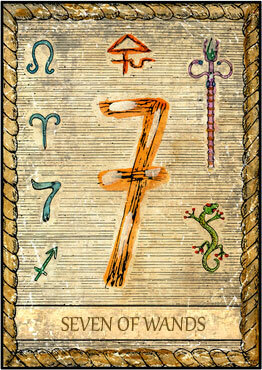 The card "7 of Wands" also stands for: Discussion, wordy dispute, negotiation, war, trade, barter, competition. Reversed it points to: Helplessness, embarrassment, fear. Warning, indecisiveness. You can find advice in card 4. It gives you tips on what will help you and what you can do. Your fourth card is "Knight of Pentacles". The main meaning of this tarot card is: Perseverance. Bustling atmosphere. A useful man. Useful discoveries. Visit from a friend, unexpected money for the questioner.. It generally means: Durability, advantage and profit. 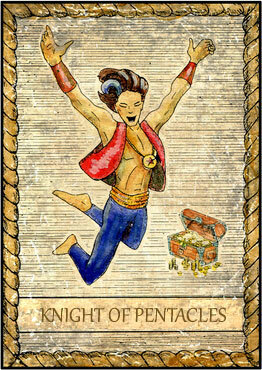 The card "Knight of Pentacles" also stands for: Responsibility and righteousness. Reversed it points to: Inertia, laziness, stagnation, discouragement, carelessness and brave man. After the cards have been laid out and interpreted, you can still find your quintessence cards. These arise from numerological calculations. Add the worth of each card within your spread and find the sum. This is the quintessence and summarizes what the tarot advises for you. The court cards (Page, Knight, King and Queen or Prince and Princess) are not counted toward this sum, they have a null value. All other cards count according to their worth, aces are one. In the Rider-Waite tarot deck, you must pay attention to the exchange of the numerical values of Justice and Strength. Justice is counted as 8 and Strength with 11. If, during the calculation, you get a number between 9 and 22, then the corresponding card adds to the counsel of the tarot.